Water hazard to left of stakes, lateral water hazard to right. "The use of red and yellow markings and the existence in the game of two kinds of water hazards is an issue that’s been discussed on and off many times over the years. The main reason for retaining the yellow type of hazard is for holes when crossing a water hazard has strategic significance to the play of that hole. Two prominent examples are often sited, namely the 1st hole at St Andrews, where the player needs to negotiate the Swilcan Burn in front of the green and secondly, the 12th hole at Augusta, where the player has to cross Rae’s Creek. In both of those cases it is felt that the fundamental challenge of the hole is to negotiate that water hazard in front of the green and, therefore, any relief option that would allow the player in certain circumstances to drop on the greenside of the hazard is to be resisted. So I think that there are good reasons for keeping two kinds of water hazards. Particularly in elite play, the use of yellow hazards is highly appropriate but I would certainly accept that at recreational level and at lower competitive levels of the game a more general use of red hazards is both common and actually makes considerable sense as it can help players to play reasonably quickly in those circumstances." A “lateral water hazard” is a water hazard or that part of a water hazard so situated that it is not possible, or is deemed by the Committee to be impracticable, to drop a ball behind the water hazard in accordance with Rule 26-Ib. Drop a ball behind the water hazard, keeping the point at which the original ball last crossed the margin of the water hazard directly between the hole and the spot on which the ball is dropped, with no limit to how far behind the water hazard the ball may be dropped. If you think about this option you will see that in almost every situation this would require a ball to be dropped on the far side of the water from the hole, no matter where the ball was played from. The line is from the hole through the point where the ball last crossed the margin of the hazard. Despite what many golfers think, the line of flight of the ball into the hazard is of no relevance to the relief options. As additional options available only if the ball last crossed the margin of a lateral water hazard, drop a ball outside the water hazard within two club-lengths of and not nearer the hole than (i) the point where the original ball last crossed the margin of the water hazard or (ii) a point on the opposite margin of the water hazard equidistant from the hole. So, for water hazards there are three options, the one noted above (Rule 26-1b), playing the ball out of the hazard without penalty, and proceeding under the stroke and distance provision of Rule 27-1. For lateral water hazards the same three options are available, plus the two in the previous paragraph under Rule 26-1c. If the above explanation has left you in any way confused I strongly recommend that you view my two short, ‘Rhodes Rules School’ videos on taking relief from water hazards and lateral water hazards at this link. Here is a shameless plug for two of my eDocuments. The complete set of 'Rhodes Rules School photo series' is available at this link. The complete set of the follow-up series, 'How Many Strokes?' has recently become available at this link. Once you have purchased these sets you will start receiving free, weekly emails of my third series, '9 Questions About .....'. Heres a question-I was in a red hazard on the fringe but inside the hazard. The ball was playable - however there was a red stake between me and my intended line of flight. The stake was in a hole and had been designed to eb removed. My playing partner said because I was in the hazard I couldn't remove the stake? If I hadn't been in the hazard I could of removed it-My argument was as it was designed by the course to be removed it was allowed to be moved? Water and lateral water hazard stakes are movable obstructions if they are easily removable, unless a Local Rule states otherwise. I have looked at a lot of rules but not found the answer. From the tee on a par 5 there is a water hazard on the left of the fairway starting about hundred yards away from tee and continuing for another two hundred yards. If the ball is hit and passes the start of the hazard then hooks left and crosses the hazard over the red stacks but continues turning left and goes out of bounds do I drop at the waters edge as I crossed the hazard first or is the ball deemed out of bounds. Rule 27-1b, if a ball comes to rest out of bounds the only way to continue is under penalty of stroke and distance. The flight that it took to land out of bounds is not relevant. Our 17th hole at Port Shepstone CC (South Africa) is a par 3 playing over water to a semi island green. On the left of the hazard is "out of bounds". This hazard is marked with yellow stakes (water hazard).My problem is this. Say you play your first shot onto the green but it runs through into the bunker. You then play the bunker shot but hit it back over the green into the water hazard (yellow stakes). You now do not have the option of going behind the hazard (keeping the point at which the hazard was crossed and the flag in a straight line) because it is out of bounds. 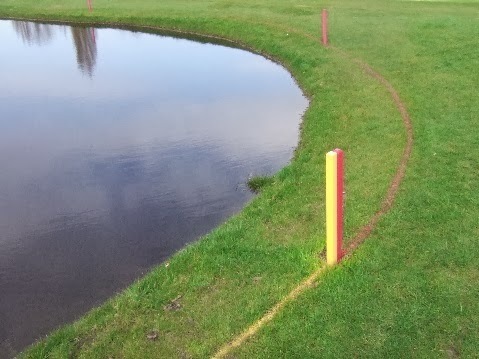 Should this not be marked as a lateral water hazard (red stakes) so as to give you the option of dropping within two club lengths of the point that the ball last crossed the hazard (but not closer to the hole). From your description of the hole your point certainly seems valid. However, the Committee may have a reason why they have decided not to do this , which is not obvious to me. Of course, you do have the option of dropping a ball in the bunker where you last played from, under Rule 26-1a. Barry we had an odd one that no one really seemed to be certain on. A player in our group played his second shot to a hole, but there was a water hazard in a dip which could not be seen by any player. The ball could not be found, and the player assumed that it was in the hazard so hit his fourth shot in line where he believed it had entered the hazard. He then found his original ball further back up the fairway in some heavy rough and was going to play that, but I informed him that he could not as he had already played another ball. He scored a six with the second ball, but our contention was that as the ball was never in the hazard, he had taken incorrect relief and should in fact have played a second ball from the original position, under penalty of one stroke and distance. His contention was that we had all agreed it had entered the hazard (although I had not!) and so he had taken relief as he understood it. It's a bit of an odd one, could you clarify? A player may not assume that a ball that they cannot find is in a water hazard. In order to take relief they must know or be virtually certain that it is in the hazard. See my blog on this subject dated 14th October 2014. So, as you say, the player should have returned to where he last played from under penalty of stroke and distance. See Decision 26/6. However, so that I can give you a ruling let us assume that it was virtually certain that the ball was in the water hazard (despite your misgivings). The ball dropped in taking relief from the water hazard was the ball in play, despite the fact that the original ball was subsequently found outside the hazard. It is worth reading Decisions 26-1/3, 26-1/3.5, 26-1/3.7, all of which are relevant to your question. If you don't have a Decisions Book you can access them on-line at the USGA and R&A web sites. I have a question about the term "opposite margin". Most bodies of water do not have straight edges. In this instance there is a lateral water course in front of a green. A players ball goes over the hazard lands just short of the green and rolls back into the hazard. The player measured the distance from the point the ball crossed the margin to the flag and then found a spot about 4 meters along the same margin equidistant from the flag. A straight line between these two points just crossed through water (we are talking a few centimetres on one side). The obvious opposite margin was some distance away. Was this a correct interpretation of decision 26-1/14? From your description, the player was entitled to take relief using the point that was equidistant from the flagstick as the reference for their drop. The key point is that an imaginary line drawn between the two points does not cross land that is outside of the hazard margin. Note that it does not have to cross water. So "the opposite" is superfluous and (ii) should read "a point on a margin of the water hazard equidistant from the hole, such that a line drawn between the two points does not cross land that is outside of the hazard margin". I do understand the point that you are making and agree that without Decision 26-1/13, which clarifies "opposite margin", it is difficult for a player to understand the option available. I will consider writing a blog on this subject. Regarding the comment above the reference should be to Decision 26-1/14. I have read your current blog on this subject and that where a lake edge runs along the front of a putting green, provided it is marked as a lateral hazard, points along it are on the same side of the hazard. In the question above (14/10) it seemed to me the place the player dropped was the same side of the hazard. At one point there is a bunker between the lake edge and putting green. The hazard line goes through the back of the bunker. The players ball rolled into the hazard after landing in the bunker and they wanted to find a more favourable place to drop. After the bunker there is a slight curve in the lake (none seem to have smooth or straight edges) and hazard line, nothing like the examples shown in decision 26-1/14, such that a straight line between the two points is only 20 cms at most inside the hazard line. The hazard line carries on after this still in front of the putting green. So was the drop on the same side of the hazard or was it the opposite side as per decision 26-1/14? It seems to me that you have answered your own question. You say, "a straight line between the two points is only 20 cms at most inside the hazard line." The fact that the line does cross the margin of the hazard means that the condition outlined in Decision 26-1/14 has been met. I do understand that this does not seem to be a logical meaning of the word "opposite", but it is within the context of Rule 26-1c(ii). So, if in the above situation it is a river instead of a lake in front of the putting green with exactly the same margin in front of the putting green - would the drop be allowed because it still meets the condition set out in 26-1/14, or disallowed because there is a more obvious opposite side/margin albeit further from the hole, so of no use in terms of rule 26-1c(ii)? The Rules of Golf do not distinguish between rivers and lakes, or even dry ditches. If they are marked as lateral water hazards the principle in Decision 26-1/14 applies, if it is applicable to the circumstances. When a water course is defined by a line but due to heavy rain the water within the hazard breaks the banks and spreads beyond the defined line does a ball landing in the water but not within the defined lines be judged to be within the hazard or can the ball be lifted claiming casual water? Any water that has overflowed from a water hazard and is outside the margin of the hazard is casual water and the player may take relief, without penalty (Rule 25-1). The player has to determine the nearest point to where the ball lies where the is no interference from the casual water and is not nearer the hole. They must then drop the ball within one club-length of this point not nearer the hole. If I am taking relief under Rule 26-1 b (i.e. dropping the ball on a line behind the hazard), how accurately does the ball have to be dropped? The rules states "keeping the point ... directly between the hole and the spot on which the ball is dropped". But it's impossible to be 100% accurate. Am I entitled to determine the dropping line as accurately as possible (marking it out with tees for example), and then drop within, say, 1 club length of that line? There is no requirement in the Rule to measure/mark the line of drop; best estimate is good enough. There is nothing that says you may drop within one club-length of the estimated line, so you should drop on the estimated line. On a par 4 a yellow staked water hazard is mostly in front of the green and comes into play on the 2nd shot with a usual carry of about 180-200 yards to the green. A player hit a 2nd shot up the right side of the hazard however the ball hit a tree and bounced into the hazard at a right angle crossing the margin about 50 yards from the green. Where should the player drop for his next shot? As I read the rule, it says behind the water hazard. The consensus here is to drop it in line where it last crossed the margin. I'm confused!! i hit a second shot on a par 4 hole on my course. my ball crossed the water hazard but hit the wall of the bunker (before the green) and went back into the water hazard. Can i take a drop in the bunker to hit my 4th shot? if so, under which rule? can someone help please? If it was a water hazard (yellow stakes and/or lines) you cannot drop in the bunker for a penalty stroke in the circumstance that you describe. If it was a lateral water hazard (red stakes and/or lines) then then there is a possibility that you may be able to drop a ball in the bunker if there is an area within the bunker that is within two club-lengths of where the ball last crossed the margin of the hazard and is not nearer the hole, Rule 26-1c. At my course in Spain there is a par 3 with a pond, roughly round in shape across the majority of the fairway, with sloping ground around the margins toward the pond. The hazard is marked with yellow stakes, including the areas to the sides. There is some debate as to the ruling amongst our members on how to proceed when a ball enters the water hazard in a lateral direction. As an example a ball hit to the left of the hazard may roll into the hazard at a right angle to the line of play. Is a penalty drop to be taken back on a line from the flag thro the point where the hazard line was crossed as this would effectively give a shot where little or non of the hazard was between the ball and flag or does the player have to play from behind the hazard, therefore keeping the hazard in play? Because it is a water hazard, defined by yellow stakes and or lines, in the circumstance that you describe the option is to drop a ball behind the water hazard, keeping the point at which the original ball last crossed the margin of the water hazard directly between the hole and the spot on which the ball is dropped, with no limit to how far behind the water hazard the ball may be dropped. As you say, this might mean dropping a ball where the only part of the hazard between where the ball is dropped and the hole is the exact point where it last crossed the margin. Rule 26-1(b) does not require that the player has to play from " behind the hazard, therefore keeping the hazard in play". It is difficuilt for me to give an accurate ruling on the circumstance of your question from the facts supplied. Presuming that there was not a Local Rule stating that the stones defined the hazard margin the ball was outside the hazard, because it was outside of a line between the stakes. However, there may have been relief from the stones, if these were loose impediments and not part of an artificial construction surrounding the hazard. You don't say why you were lifting and placing within 6 inches, presumably this is because there was a temporary Local Rule for preferred lies through the green. If this was the case you were entitled to place your ball within the permitted area on the grass outside the hazard margin. Tks waiting on confirmation on local rule.. you say about the preferred lies. This was the reason I was placing within six inches. If I was onside the hazard. Due too preferred less wa I entitled to place outside hazard line? If your ball was at rest outside the hazard you can place the ball according to the Local Rule; if the ball was inside the hazard you may not take relief without inurring a penalty (Rule 26-1). Thanks for your blog - it's a great resource, and I'm sure everyone appreciates the time you spend answering our questions. Last weekend I sliced my tee shot toward a lateral water hazard that was surrounded by several trees - I heard it hit a tree, but there was no way to determine which one. I was able to find my ball at the opposite side of the hazard because it had been emptied of water - the bottom was firm and the ball could have bounced around in any direction, so there was no way to determine where it had crossed the margin of the hazard. Since I didn't know where I could drop outside the hazard, I elected to play the ball from inside the hazard, which led to more problems and eventually a score of 8 on the hole. Is 26-1a your only option when you cannot determine where the ball crossed the margin? Providing it is known or virtually certain that a ball has come to rest in a (lateral) water hazard the player can use their best judgment to determine the point where the ball last crossed the hazard margin, with the assistance of their marker, fellow-competitor, opponent or even a spectator. What about if the ball is flying out of bounds and lands in a lateral hazard? I don't understand your question. If a ball comes to rest in a lateral water hazard it either has to be played from where it lies, or relief can be taken for a penalty of one stroke, under Rule 26-1. A ball cannot be both in a water hazard and out of bounds. It is the responsibility of the Committee to define accurately the margins of water hazards and lateral water hazards (Rule 33-2a), so there should be a Local Rule clarifying the boundary on this hole. However, from the informtion that you have supplied, it seems to me that the ball carried over the out of bounds area and back onto the course, in the lateral water hazard. If the other options for relief are not available the player must play from where they last played from, under penalty of one stroke. On our course there is a hole with a narrow hedge at around 230 yards from the tee backed by a ditch (both are in a red staked area). The ditch runs across the course nearly at right angles to direction of play. Some members are claiming that if their shot goes in the hedge and therefore the hazard they can drop on the other side of the hedge under one shot penalty. After some dubious two club measurements apparently not nearer the hole they can play for the green without issue. Any views - clearly should be a yellow stake I guess. Also if I'm trying a short range lob shot onto a green 10 yards away and thin it 70 yards into a water hazard or some jungle (either lost ball or unplayable) can you confirm that in all cases I can simply drop another ball down as near to the original under penalty of one shot even though I am dropping nearer the hole than where my original ball finished? I do not claim to be an expert on the correct marking of courses, but from what I understand from your description it does seem as though the hazard should properly be marked as a water hazard with yellow stakes. I can confirm that a player always has the option of playing from where they last played from for a penalty of one stroke, even if that place is nearer to the hole, Rule 27-1a. Hi, what happens when you hit out of a Bunker and the ball goes over the green and into a water hazard. Do you re-drop in the bunker as the point of where the ball entered the water hazard would be closer to the hole? If a ball touches the line of the harzard marking, is it still in play or consider it is in harzard ? Which section of the rule of golf clearly states this ? .... A ball is in a water hazard when it lies in or any part of it touches the water hazard. Remember that the water hazard stake is almost always a movable obstruction. If the player moves the ball whilst removing the stake, they must replace the ball, but incur no penalty. Per rule 26 1b. "There is no limit to how far the ball may be dropped". Does this include into the fairway? Yes, or into a hazard! Anywhere on the course that is on the line. Barry, I could use your help confirming I played correctly yesterday. I hit into a lateral water hazard to the right of a green ( if the green is a clock face I'm at 2.5 ), found the ball at the bottom but not in water so I decided to play it as it lies. It was nestled down among some grass and weeds that were taller than the ball so I hovered my club so as not to touch them behind the ball. I think took a swing and skulled the darn thing over the green. Now, the same hazard I was in ( creek ) wraps the front of the green but is yellow here. I went from the lateral water hazard to the water hazard. The point where the ball last crossed the margin of the yellow hazard ( 7 o'clock ) is on the green side so I can't drop there. I can go back along that line but that line puts me in the red creek again ( 1.5-2 o'clock ) or staying on that line but not on the red hazard I'd closer than I was originally. So to not be closer to the hole I could play from where I last played in the red hazard. I instead took the last point in line with the flag but went back along that line over the yellow and hit from there. ( 7 o'clock headed sway from the center of the clock ) Was all of those thoughts correct? Did I play it legally? I think that I am confused! It seems to me that the only relevant point is where your ball last crossed the margin of the water (yellow) hazard. Forget the lateral water (red) to the right of the green as that is not relevant, unless you want to take the option of dropping a ball where you last played from (Rule 26-1a). The other option is to take a line starting at the hole through where the ball last crossed the margin of the yellow hazard, which means going across that water to the other side and dropping a ball anywhere outside the hazard margin on a continuation of that line (Rule 26-1b). There is one other (complicated) option; see my blog on Rule 26-2 dated Wednesday, 6 November 2013. If I am misunderstanding the situation please email me with a diagram. Essentially, I'm trying to confirm is that the line you draw with the hole and the last point of entering the hazard is only drawn from the flag through the last point and never from the last point through the flag in the opposite direction. Are both lines acceptable or only the one starting with the flag? I'm inclined to think the flag is the starting point but want to confirm. Thanks. I can indeed confirm that the flagstick/hole is the starting point of the line, as in my previous answer and the wording of Rule 26-1b that I referred you to! On our course there is a deep ditch down the right hand side of the 17th, marked by red stakes on the course side and o/b on the other. The ditch is quite deep and sometimes dry. If a ball lands in the ditch but the palayer cannot retrieve the ball due to the depth or in wet conditions due to safety considerations can he drop another ball and take the penalty of one stroke. Of course. One of the relief options for taking relief from a lateral water hazard (red stakes), under penalty of one stroke, is to drop a ball outside the water hazard within two club-lengths of and not nearer the hole than the point where the original ball last crossed the margin of the water hazard, Rule 26-1c. Decision 27/18 deals with a gate in a boundary fence when open (it does say that when closed it is part of the boundary fence which is completely comprehensive), but let's say it is open to 90 degrees, measures at least 2 meters, and can not be closed because of rust and old age. The gate of course interferes with the play, in this particular case the gate appears some 20 meter from a green and in semi rough where many golfers would find themselves after a shot over a water hazard. How is one to deal with the gate as a player, would equity mean that the gate is not an obstruction and no free drop would be allowed? First, if this is an actual scenario, I wonder why the Committee is not meeting its responsibilty of accurately defining out of bounds (Rule 3-2a(i)). You say the gate "can not be closed because of rust and old age". How has the Committee let this situation continue over this period of time? To answer your question, it is my opinion that the player may not take any relief from the gate, without incurring a penalty. The Rules are clear that a player may not take relief without penalty from from anything that defines out of bounds. Can you describe what is Rule 3-2a(i) ? There is no Rule 3-2a(i)! I presume that you may mean 33-2a(i), which states that the Committee must define accurately the course and out of bounds. I recommend that you chaeck out section 4-2 (Marking the Course - Out of Bounds) in the R&A publication, 'Guidance to Runing a Competition', which can be viewed on-line at www.randa.org. Finally, assuming this was your question, I recommend that you read the Definition of Out of Bounds and the various Decisions relating to Rule 27-1. My apologies. I now see that you were drawing attention to my typo in the reply to Marga's comment, which unfortunately I cannot edit to make the correction. Hi Barry. Usually I can find an answer to my question on your blog but not this tiime. I apologise for the lengthy post but.... we have a road crossing our course. A player submitted their card then whilst talking about their score after the game they realised they had signed for a wrong score as they had forgotten/didn't know it was a penalty drop when the ball ends up on the road but they took a free drop. There is a yellow stake at one end of the road which they were told makes it a water hazard but this was not visible from where they were. Is this a DQ or given the 2016 change to ruling would it be penalty shots added for not adding penalty they didn't know about. Would it make a difference if the local rule was written in the card. Secondly if the marker didnt realise/had forgotten there was a penalty drop would they also be disqualified for signing the player's card with a wrong score or for wrongly advising about the rules. In the circumstance that you describe, if the competition had closed the penalty must not be imposed (Rule 34-1b). If the competition had not closed and the player had correctly dropped their ball in a place that was permitted by the Local Rule, the Committee should ad one penalty stroke under Rule 26-1 and another 2 penalty strokes under Rule 6-6d. The fact that the Local Rule was printed on the card is not relevant, providing the player had not been made aware of the breach before returning their score card. A marker does not incur any penalty for not being aware of a breach of Rule by the player whose card they are marking. A short one: My ball came to rest against both a red and yellow stake indicating the change of hazard. In which one is my ball suposed to be: Water hazard or Lateral Water Hazard. May the player chose his option? If the ball had only been touching the yellow stake it was in a water hazard; but as it was partly touching the red stake, it was in a lateral water hazard, offering the additional option for relief under Rule 26-1c. However, in either case the stakes could have been removed (movable obstructions) replacing the ball without penalty if removing the stakes caused the ball to move, and the stroke made without any penalty. Thanks for replying. On which rule/decision do you base your answer? I have been looking everywhere and didn't find anything. Definition of Water Hazard (at the front of the Rules book) and Rule 24-1 Movable Obstructions. I know the rules and the definitions. My point is who or which rule decides whether my ball is lying in a WH or in a LWH when the ball touches both yellow and red stakes. I like your point saying you have the WH Relief Options anyhow but since it touches the red stake as well you get two more options. But I have not found anything in the books. There is the decision about touching a bunker and a LWH at the same time time but not about touching two different Water Hazards. Maybe it is just common sense? Please read my original answer again. If a ball touches a red hazard stake it is in a lateral water hazard, as per the references I have provided. It does not matter if it also touches a yellow stake, because the options for relief are the same, except that Rule 26-1c does not apply. But, why does this matter? The stakes may be removed and the player can play their ball as it lies without taking relief. We have a par 3 with a water hazard in front however the runoff after the water hazard is marked with red stakes. If you land in the hazard marked with the red stakes can you take relief under the red stakes or do you need to go back under the yellow stakes. Not if the ball did not pass over the hazard margin that was marked with red stakes. The reference point is where the ball last crossed a margin of the hazard, which in the circumstance that you describe is presumably over yellow stakes on the far side of the water from the putting green. Hi Barry. Thanks for your blog. If close to a green you want to invoke either 26-1c or 28C the permitted drop area of two club lengths might stretch over part of the green and part off. If under those circumstances the player drops off the green and the ball comes to rest on the green (within the two club lengths area and not nearer the hole) would the player be requested to re drop in accordance with Rule 20-2c(iii)? In the circumstance that you describe the player must drop their ball again under the Rule that you have quoted, Rule 20-2c(iii).